A park with the aim of preserving the ecological balance is badly needed, and in not-so-wealthy countries like Bangladesh this is particularly noteworthy since, understandably, the environment is not a priority. Global warming has made a lot of people nervous, scientists say that if it is not taken care of now, it would ultimately have catastrophic consequences for all living beings. Such an initiative is not only good for the ecology; it is also good entertainment. An eco-park, the “Madhutila Eco-park”, is such an initiative taken by the Forest Department at Nalitabari upazila in Sherpur district. The eco-park park, which caters to the needs of tourists and other recreation-seekers, is the first thing in Mymensingh to take steps towards preserving the ecological balance of the region. This region includes Mymensingh, Sherpur, Jamalpur, Tangail, Netrokona and Kishoreganj districts. Now the eco-park covers an area of 380 acres at Sameshchura and Puragoan area under the Madhutila Forest Range. Madhutila Eco-Park is located in Puragaon Union under the Madhutila Forest Range in Nalitabari Upazila of Sherpur district and has become an attractive spot for tourists as well as for the picnic groups coming from different parts of the country. The Divisional Forest Office, Mymensingh under the Environment and Forest Ministry has taken a number of steps to make the place attractive for the tourists. Madhutila, a place abundant with natural beauty is in Nalitabari, an upazila of Sherpur. The beauty of the small hills is something that attracts visitors. To enjoy the beauty of nature, hundreds of tourists throng to the spot for picnic and tour purposes every day during the dry season. The eco-park also gets a good number of foreign tourists. To make Madhutila Eco-Park similar to Safari Park in Chittagong, the Forest Department started the first phase of the “Madhutila Eco-Park Project” in the 1999-2000 fiscal year on 100 acres of forest land. The project's goals included making feeding places for the birds and animals, the plantation of rare species of trees including decorative and medicinal trees to attract tourists. Under the first phase of the project, the Local Government and Engineering Department (LGED) constructed a rest house, office and residential accommodation for the officials and employees. They also built sculptures of elephants, alligators, tigers, deer, mermaids, snakes and frogs. They dug lakes too, and constructed a watch tower at the top of a small hill. This first phase was completed in June 2004 with a cost of Tk. 164.24 lakh, sources said. The second phase of the eco-park project started in 2005-2006 fiscal year with a cost of Tk. 4 crore and the work is expected to be completed within the 2008-2009 fiscal year. 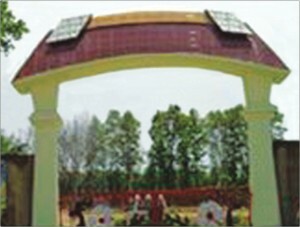 The second phase of work includes constructions of a mini zoo, a children's corner, murals of animals and plants at the main gate of the park to draw the attention of tourists, more picnic spots, information center, display models, parking zone, steel made umbrellas and benches for the visitors, said Md. Akbar Hossain, Divisional Forest Officer (DFO), Mymensingh. Madhutila Eco-Park is 221 kilometers away from the capital city Dhaka and 30 kilometers away from Sherpur town. A tourist from Dhaka needs four to four and half hours to reach Sherpur district town by a comfortable bus journey from Mohakhali, and the spot is 16 kilometer off the Jamalpur town. 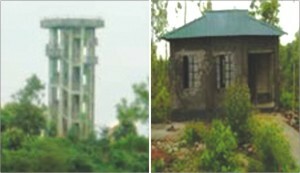 Tourists can stay at the rest house of the eco-park through advance booking and at the hotels of Sherpur town with their families. When contacted, the Divisional Forest Officer told the writer that Madhutila Eco-Park will be a much greater attraction for tourists after all the development work is completed. Eco-park would be a place for smooth ecological harmony for rare species of trees and animals, he said. He added that many of our wild animals were on the verge of extinction and they should be protected to preserve the ecological balance for our future generations. He also said that some wild animals including deer and peacocks were saved during the recent drives conducted by Joint Forces in the district and have been set free in the eco-park. The park will be a good source of revenue which will surely create employment opportunities for people, he added. Ten picnic spots will be created to avail the rush of picnic groups mainly in the winter season and presently three picnic spots are available and each spot will be rented at Tk. 800 to Tk. 1000. The eco-park has a VIP rest house with four rooms which are rented at TK. 2500 per day. A project to construct bridges and water fountains will also be undertaken some time. Md. 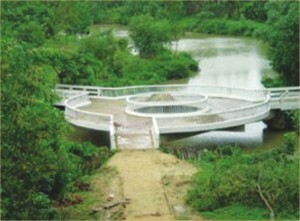 Mujibur Rahman, a lecturer of Jahanara Latif Mohila Degree College who resides at the Nalitabari Upazila headquarters with his family, told the writer that if the concerned authorities take proper steps to make the eco-park an attractive one in the country, surely it would draw the attention of the huge numbers of visitors. The park will also do much for our national economy, he added.